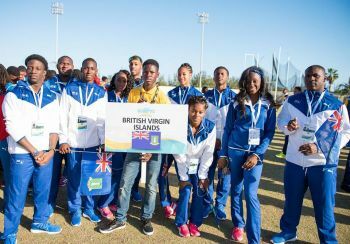 NASSAU, The Bahamas- The Virgin Islands picked up a bronze medal on the opening day of competition at the 2018 Flow Carifta Games in Nassau, The Bahamas on Saturday, March 31, 2018. It came in the 100m Boys Under 20 Final when Rikkoi A.R. Brathwaite clocked 10.46 seconds for third place. 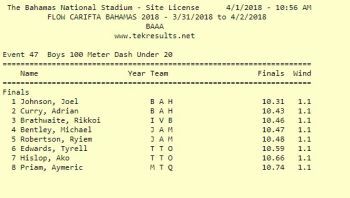 The race was won by Joel Johnson of The Bahamas in 10.31 seconds while the silver medal went to Adrian Curry also of The Bahamas, who ran 10.43. There was a little disappointment for the Virgin Islands; however, when medal hopeful Djimon L. Gumbs missed out on a podium finish in the Boys Under 20 Discus Throw (1.75K), finishing fourth with a best throw of 53.24 metres. 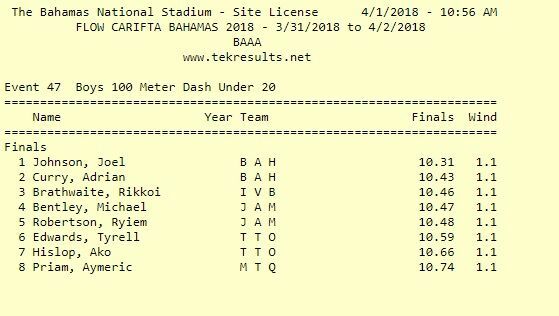 According to the BVI Athletics Association, Brathwaite became the first medalist in the territory's history of the Boys 100m Under 20 Carifta Games event, dating back to 1976. Brathwaite also had the distinction of becoming the first 100m finalist at the Carifta Games last year. Interestingly, it was in The Bahamas in 1978 that Dean H. Greenaway aka ‘The Sportsman’ became the first ever VI athlete to medal at the Carifta Games. He took silver in the 400M and later was one of the first group of athletes from the Virgin Islands to represent the Territory in the Olympic Games (Atlanta 1984). Meanwhile, Brathwaite’s medal is the 50th won by the Virgin Islands since Greenaway won the first in 1978. Twelve (12) of those medals have been won in Nassau, The Bahamas. 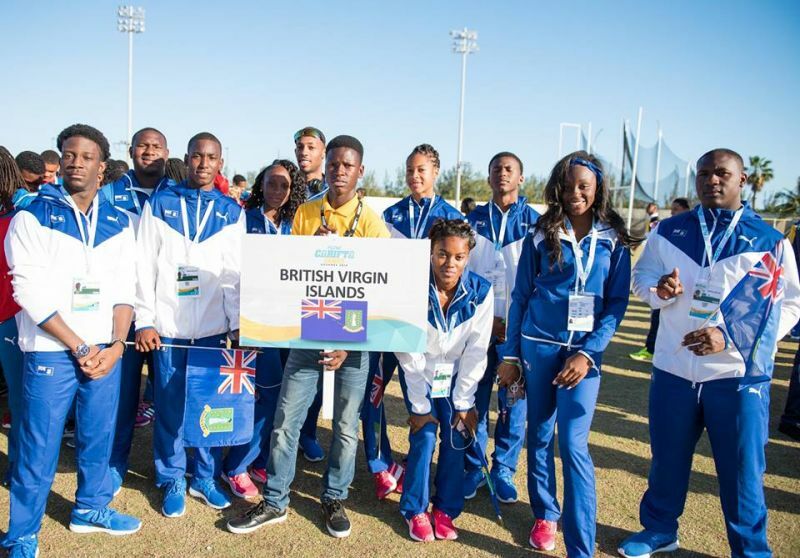 The Virgin Islands has been represented at Carifta Games since 1976. 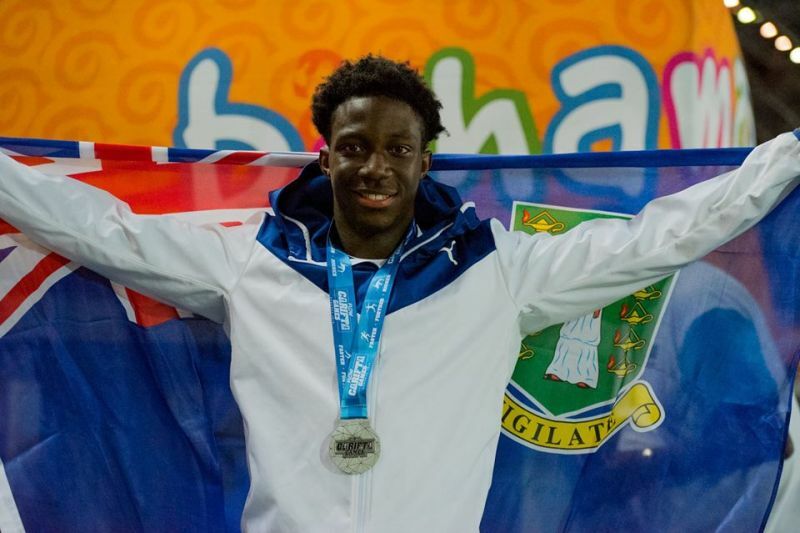 There was also a silver medal for the US Virgin Islands (USVI) when Evan Jones placed second in a tight finish in the Boys Under 20 1500m Final on March 31, 2018. Jones was timed in 4:02.93. Javon-Taye Williams of Jamaica won with a time of 4:02.02 while Alexandre Gauthierot of Guadeloupe was third in 4:03.26. Competition continues today, April 1, 2018 with Beyonce A. DeFreitas and Joshua Hill among the Virgin Islands' athletes to feature. Good job young man, continue working hard and that hard work will pay off. Keep striving from good to great. Congrats VI Youngs’ strong. Indeed, you look like your mom! Awesome! Congratulations Rikkoi! God bless you young man. You must not know how hard this competition is. Top guys in the entire Caribbean. To be in the top three is a great move forward for the BVI. He beat 24 other boys who qualified to be at the Games just to compete at the finals. We are opening doors, one athlete at a time. and one step at a time. Congrats Rikkoi and TEAM BVI!!! VI Proud wheter 1st, 2nd, 3rd! The proper word is "Gold". Congratulations to you Rikkoi. You have made us all proud. And we will get there.